Angel City Lumber was created in 2015 by Jeff Perry and Charles DeRosa. It was Jeff’s big heart that led him to wonder why Los Angeles couldn’t be reusing all the trees it was cutting down. It was his big mouth that roped Charles into joining him on this mission. And it was their combined naiveté that led to a 10,000 sq ft warehouse in Boyle Heights full of slabs and boards made from Los Angeles trees. We officially opened for business in 2017. Since then, we've seen a powerful reaction to urban lumber in Los Angeles. 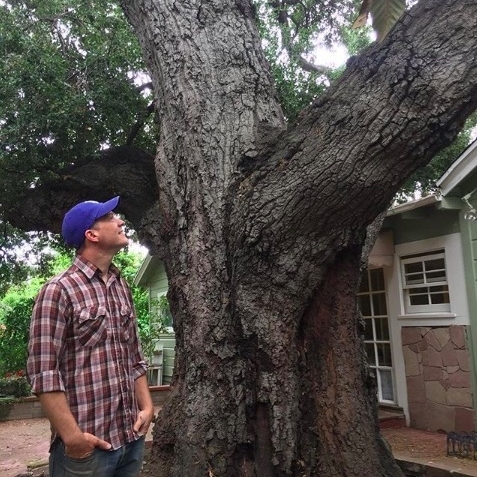 We have a growing team of craftspeople, wood workers and environmental experts, all of them excited by the prospect of reusing as many Los Angeles trees as possible. Todd’s background as a producer (sort of), director (there was that one time) and actor (really?) led him to work for Apple and discover his true passion for logistics, systems and organization. Todd has transformed Angel City Lumber from a few piles of disheveled wood into the smooth running operation it now is. Vincent heads up our tree recovery department. 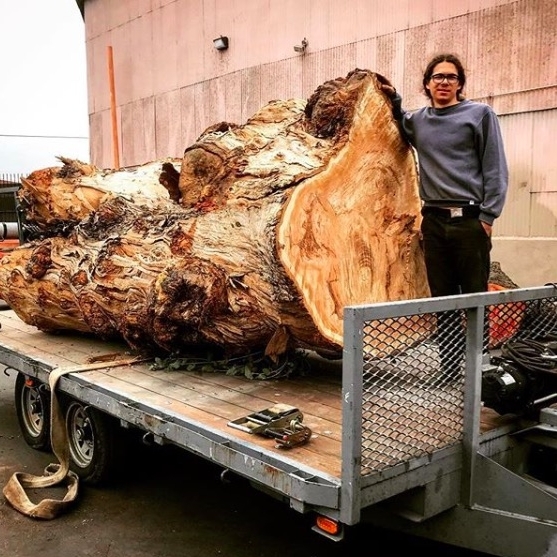 Regularly tasked with the (very) difficult job of recovering 8,000 lb logs from backyards, construction sites and highway medians around Los Angeles. But don’t let Vincent’s cool demeanor fool you, he’s got a burning, desperate, passionate love for pulling heavy logs behind a 1997 Dodge 3500. 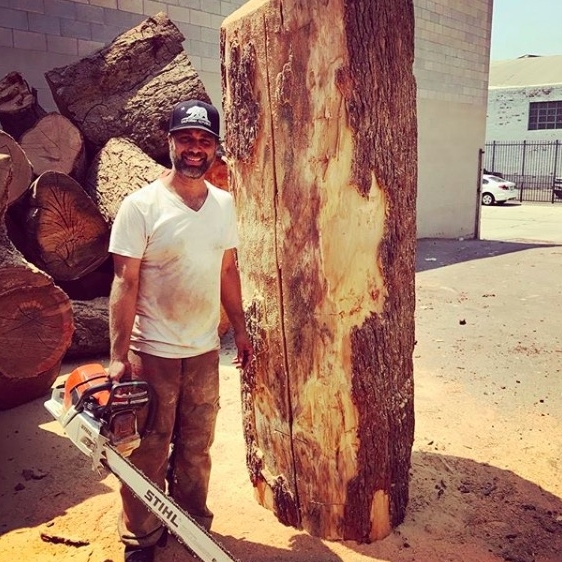 After ten years of working in the film business, Charles made the natural decision to join Jeff Perry in opening an urban lumber yard in Los Angeles. Since then he has taught himself human resources, payroll and workers compensation. He is no fun to talk to at cocktail parties. On paper Brady, our in house business development and sustainability expert, looks pretty good. An engineer with a resume chock full of work in sustainable consulting, energy conservation and building services, Brady’s skill set is invaluable to Angel City Lumber. But don’t be deceived, even with all those brains, he’s a woodworker at heart - and we all know what that means! Shayna discovered woodworking cutting animal shapes in her uncle’s garage when she was six. Now in charge of our mill works department, Shayna keeps the jointer and planer busy, though her trusty hand plane is never far from her side. The closest thing to a renaissance man Boston is likely to produce, please give it up for Jeff, the Zen master of Los Angeles urban lumber! With a burning (slightly itchy) love for making LA a better place for his kids to live, Jeff is a mere whisker away from attaining full urban lumber enlightenment - if only he would stop mixing up his globulus Eucalyptus with his camaldulensis. Shop cat extraordinaire, Robles was a stray found amongst some oak logs at Angel City Lumber. She prefers salmon over tuna, pets over naps, and she likes her 8/4 sycamore sanded to 220, at the least! !